The Budget fine print shows financial support of Rs 384 crore has been provided to MTNL. The stock is up about 1 percent at Rs 13.9 a share. Moody’s believes continued slippage on fiscal deficit is credit negative for the Sovereign. Auto share are spiking today on the back of the announcement of the tax benefits to middle class taxpayers that would lead to an increase in disposable income and hence discretionary consumption. The rebate under Section 87A of the Income Tax Act has been enhanced to Rs 12,500 from Rs 2,500 earlier. The threshold has also been enhanced to income of Rs 5 lakh from Rs 3.5 lakh earlier. This will benefit taxpayers only to the extent of an annual income of Rs 5 lakh. The basic exemption limit and tax-slabs remain the same. What this means is the benefit is applicable only to those whose earnings are under Rs 5 lakh but not more than that. Also, those earning less than Rs 5 lakh will have to pay tax initially and seek a rebate while filing their returns. DEA Secy Garg said the roll-out of farm income support scheme starts in November. He pointed out that this scheme does not include those getting government support. Measures for the salaried class will be effective April 1, Subhash Chandra Garg, Economic Affairs Secretary told CNBC-TV18. The revenue loss from the change in income taxes will be roughly Rs 24,000 crore, he said. Sensex gives a 300-point salute to the raft of announcements, as the market expects an uptick in consumption. Will the Budget be enough to put this market in firm bull market territory? Time will tell. – Nazim Khan, Senior Editor. Notional rent on unsold real estate inventory – Tax to be levied after 2 years from date of completion of project. Previously, it was 1 year. Real estate stocks such as Oberoi Realty, Godrej Properties, Sunteck Realty, HUDCO rally. – Krishna Karwa, Research Analyst. 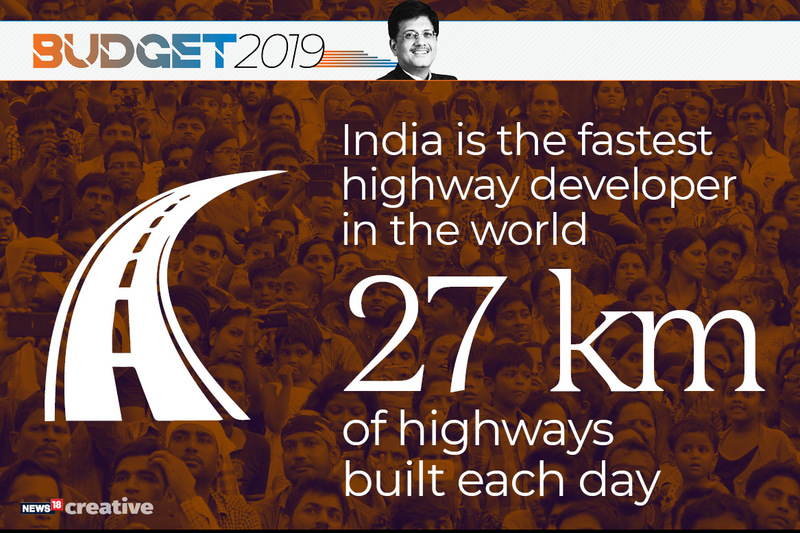 Goyal concludes his Budget speech with the quote, ” Ek paav rakhta hun, hazaar raahein phoot padti hai.” which literally means one step opens up a thousand roads. Also, this Budget shows NDA’s desperation. This probably the best way to gain back trust of the voters. Or, if the coin flips (by chance), the next Government will have a really tough time to live up to all the promises the Modi Govt is making right now. – Sounak Mitra – Associate Editor. Arun Jaitley might be missing all the fun while Piyush Goyal is cutting the cake that he (Jaitley) baked. – Sounak Mitra – Associate Editor. 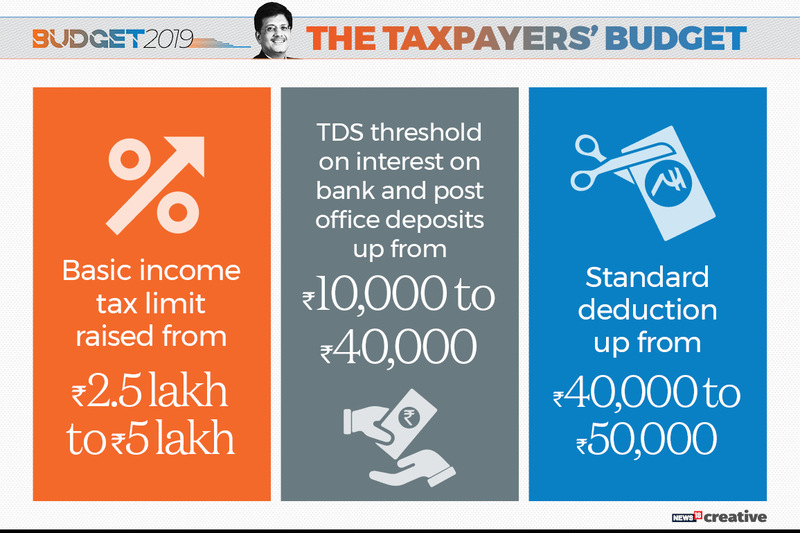 TDS limit hiked from Rs 10,000 to Rs 40,000 on Post-Office savings. FM raises standard deduction from Rs 40,000 to Rs 50,000. Income upto Rs 5,00,000 to be exempt from income tax, to boost consumer spending. Positive for FMCG stocks and auto stocks. – Ruchi Agrawal – Senior Research Analyst. That puts Rs 12,500 per annum in people’s pockets—more than Rs 1,000 per month, more than double what the farm package gives to small and marginal farmers. – Manas Chakravarty, Group Consulting Editor. It finally comes. From ‘Thank you tax payers’, to doubling the slab for tax rebate. Now, tax payers would say: “Thank you Mr FM”. – Sounak Mitra – Associate Editor. The shortest interim Budget was given by HM Patel in 1977. This could be the longest. – Prince Thomas, Corporate Bureau Chief. From ‘what we have done’ Budget, it has suddenly turned into a ‘Dream Budget’ — all about dreams and wishes towards 2030. – Sounak Mitra – Associate Editor. 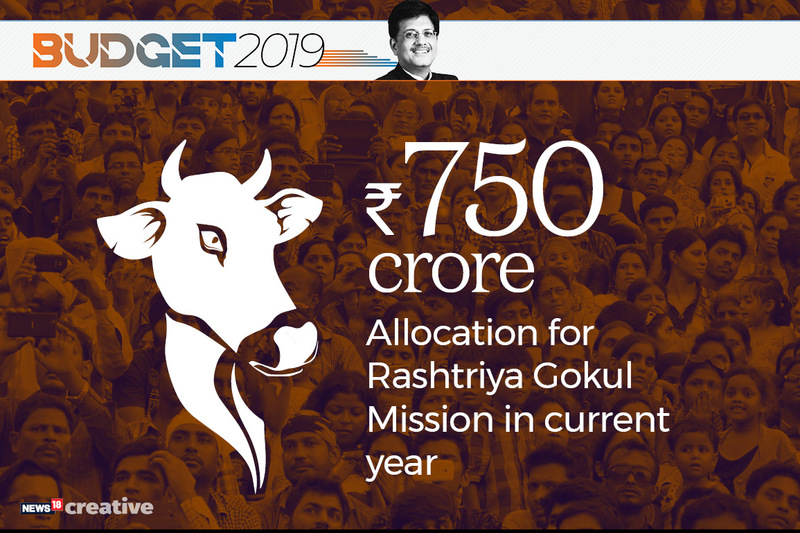 In Piyush Goyal’s Budget, there’s place for everybody — Kissan, Jawan, Gau mata, and even the traders. But, not the income-tax paying salaried class. Well, they don’t figure in the scheme and theme of Election. – Sounak Mitra – Associate Editor. 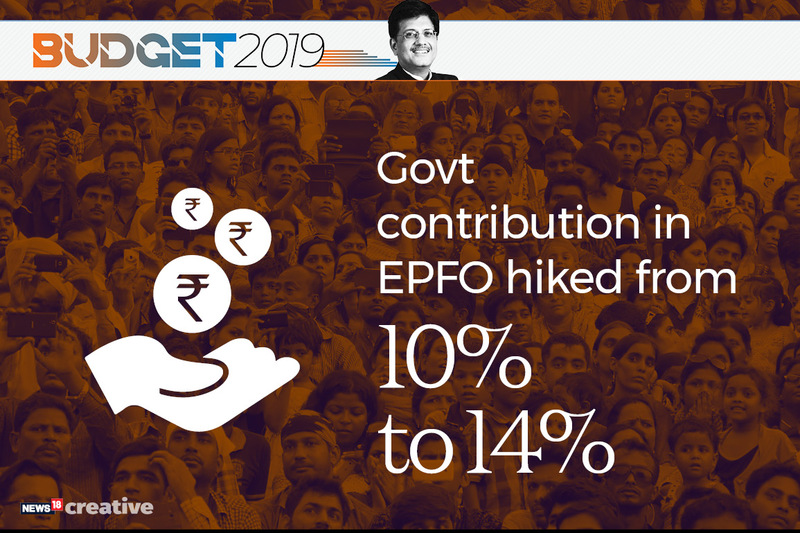 Expenditure target for FY20 at Rs 27.84 lakh cr: FM Goyal. FM sets FY20 Fiscal Deficit target at 3.4%. Vision statement: As Keynes said, in the long run we are all dead – Manas Chakravarty, Group Consulting Editor. Micro irrigation schemes to be given attention – allocation amounts awaited – allocations to be positive for Jain irrigation, KSB pumps, Kirloskar brothers and Shakti pumps. – Ruchi Agrawal – Senior Research Analyst. “India will lead the world in transport through electric vehicle (EV) and energy storage devices”, FM said. Several international automotive companies like Suzuki, Nissan, Hyundai, Toyota, Renault are lining up multiple EV launches through direct imports as well as giving a boost to local manufacturing of EV. – Swaraj Baggonkar – Senior Assistant Editor. Fisheries stocks – Apex Frozen, Avanti Feeds, Waterbase have declined after initial surge on interest subvention announcement. Allocation amount for schemes awaited. – Anubhav Sahu – Principal Analyst. The government is laying out the vision for the most important dimensions for the next 10 years to make India a $10 trillion economy and enhance ease of living including development of roads, railways, seaports, health, among other things. The plea by Hero Motocorp, Bajaj Auto and TVS Motors to bring two-wheelers under the 18% GST slab from 28% GST slab seems to have gone unheeded. – Swaraj Baggonkar – Senior Assistant Editor. Despite high speculation, no changes in tax slabs and no investment incentives for salaried investors and tax payers. – Nayanika Chakraborty – Senior News Co-ordinator. Our govt wants GST burden on homebuyers to reduce. So we have requested the GST Council to set up a group of ministers who will now work out how to reduce the burden on homebuyers. Reducing tax for the middle class has been a priority, he says. 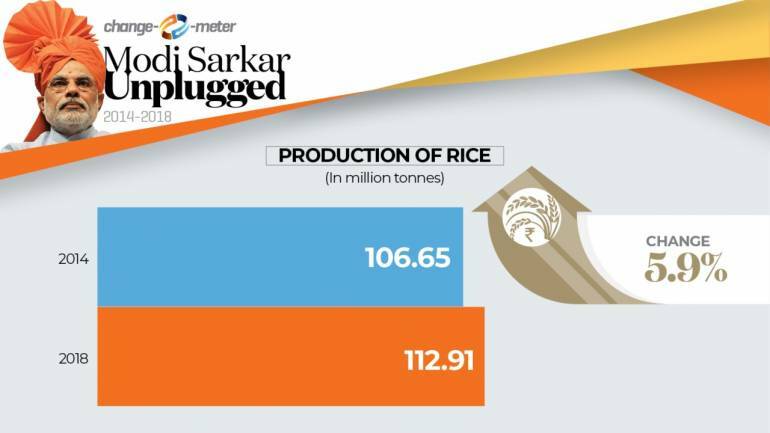 From the MSP of rice and wheat to the area under cultivation for pulses, see how the Modi government has influenced key agricultural indicators. Tax scrutiny will also now be done electronically and there will be no interaction between the tax authority and the taxpayer. Single window clearance for shooting films for Indian filmmakers. Railway capital expenditure goes up from Rs 53,060 crore in FY19 to Rs 64,586 crore in FY20 – positive for railway capex linked companies. – Madhuchanda Dey – Head Research. Our government hopes to create 1 lakh digital villages in the next 5 years. 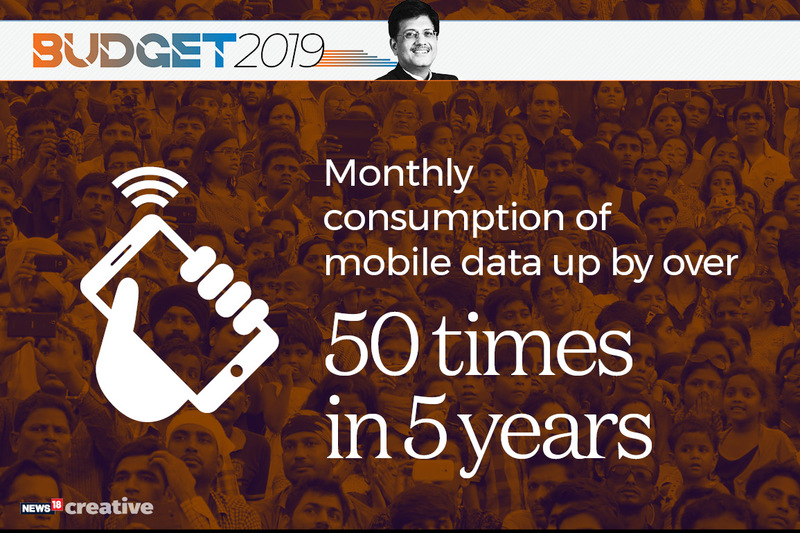 Jan Dhan, Aadhaar mobile, and direct benefit transfer have been game changers, Goyal notes. Aadhaar is now near-universally implemented and helped ensure poor get the benefit of govt schemes directly in their bank accounts, he says. Cost of data and voice calls in India is possibly the lowest in the world: FM. Indian Railways budget outlay Rs 1,48,658 crore. 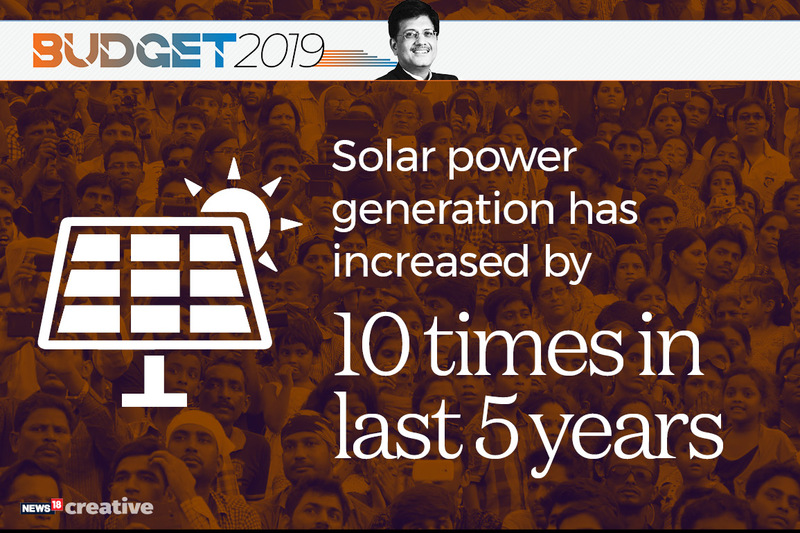 Installed solar generation capacity in India increased by 10 times in the last 5 years. Inland freight waterways have commenced from Kolkata to Varanasi. North-eastern states may also be connected in due course. 1. 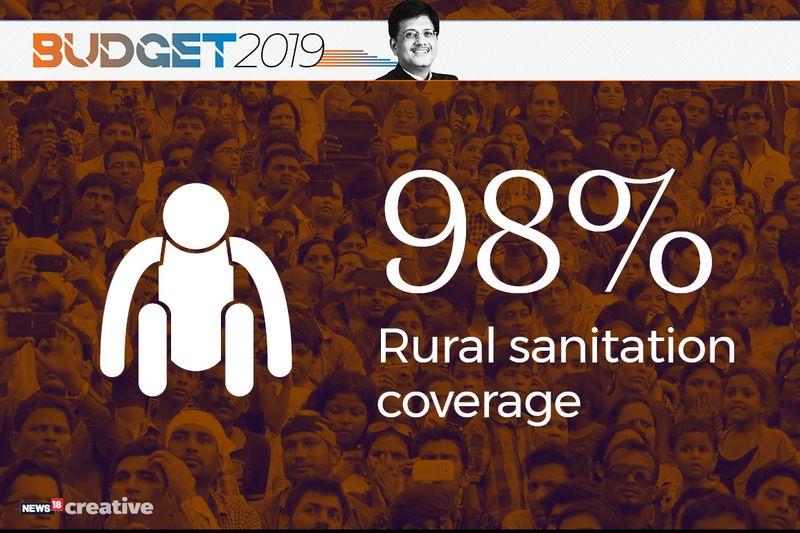 India has achieved over 98% rural sanitation coverage. 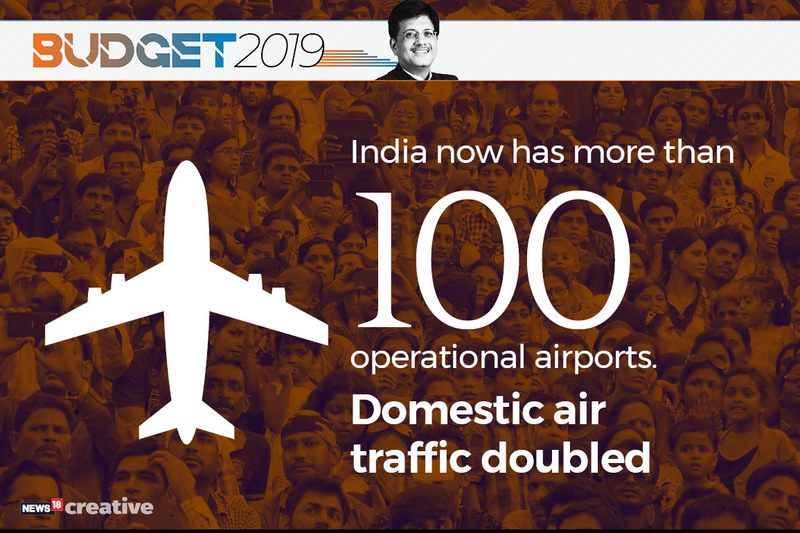 Goyal talks about 100 plus airports now in India. But the number is far below the government target. – Prince Thomas, Corporate Bureau Chief. Our soldiers are our pride and honour. OROP, pending for the last 40 years, has been implemented by us: Piyush Goyal. Already disbursed Rs 35,000 crore for our soldiers under OROP, Substantial hike in military service pay has been announced. Domestic air passenger traffic has doubled in the last 5 years. Construction of rural roads has been tripled; 15.8 lakh out of a total 17.84 lakh habitations have been connected with pucca roads under #PMGSY. Bharat has got the full attention of the Govt. Farmers, cattle, unorganised segment, rural women, are among the major themes. But will these spur rural income? No disruptive intervention, yet. – Prince Thomas, Corporate Bureau Chief. Defence Budget increased to Rs 3 lakh crore. Domestic passenger traffic has doubled in the last 5 years and this will mean new jobs in the aviation sector. Rs. 1 crore loan can now be obtained under 59 minutes: FM. Promises, and claims – Sounak Mitra – Associate Editor. Over Rs 35,000 crore has been allocated under the ‘One Rank One Pension’ scheme so far by the BJP government. Goyal now moves on the defence sector. We had promised to implement One Rank One Pension. We have already disbursed over Rs 35,000 crore after implementing the scheme in true spirit, he said. India’s youth have turned into job creators from job seekers. The country has become the second-largest hub for startups: Piyush Goyal. 9 nine priority areas identified; National Artificial Intelligence Portal to be developed soon: Piyush Goyal. Pension scheme to benefit 10 crore workers in the unorganised sector. Those who join at 18 years of age will have to contribute a mere Rs 55 per month. The government will contribute equal matching share in the pension account. Govt e-marketplace GEM has transformed public procurement making it transparent and efficient. Transactions of over Rs 17,000 crore has been done. Committee under NITIAayog to be set up to identify and denotify nomadic and semi-nomadic communities; Welfare Development Board to be set up under MSJEGOI for welfare of these hard-to-reach communities and for tailored strategic interventions : FM. There are a total of 42 crore workers in the unorganised sector in numerous industries. We must provide comprehensive social security coverage: Piyush Goyal. 6 crore households have been given cooking gas connections so far, the target by the end of next year is 8 crore households. You have to give it to this government. While they sometimes fall to the temptation of naming new schemes after past leaders, many of their new schemes carry a simple convention — they carry the the term “Pradhan Mantri”. – Nazim Khan, Senior Editor. 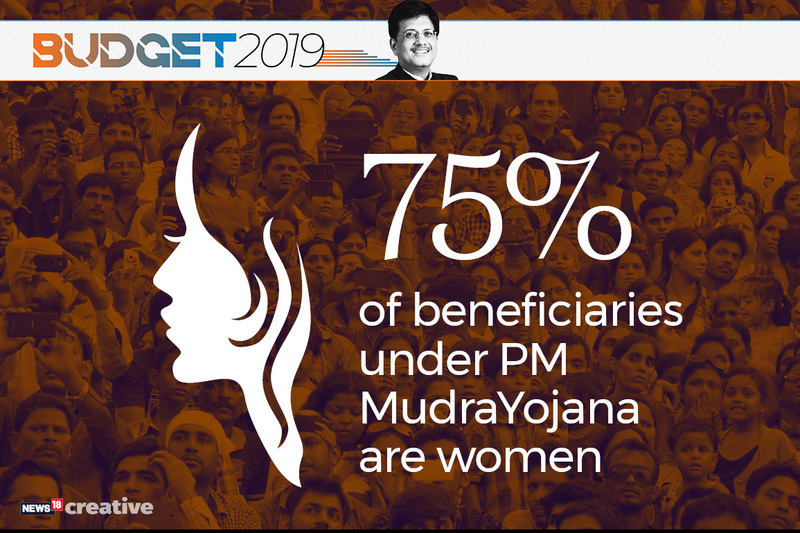 FM Goyal moves on the welfare of women in the country. 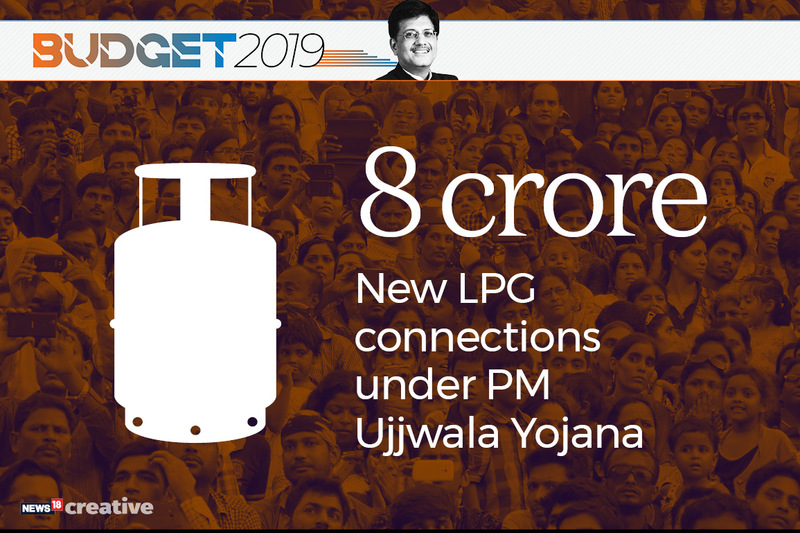 Nearly 8 crore free LPG connections were planned to be provided to relieve women from use of woodfire for cooking. So far 6 crore connections have already been provided. 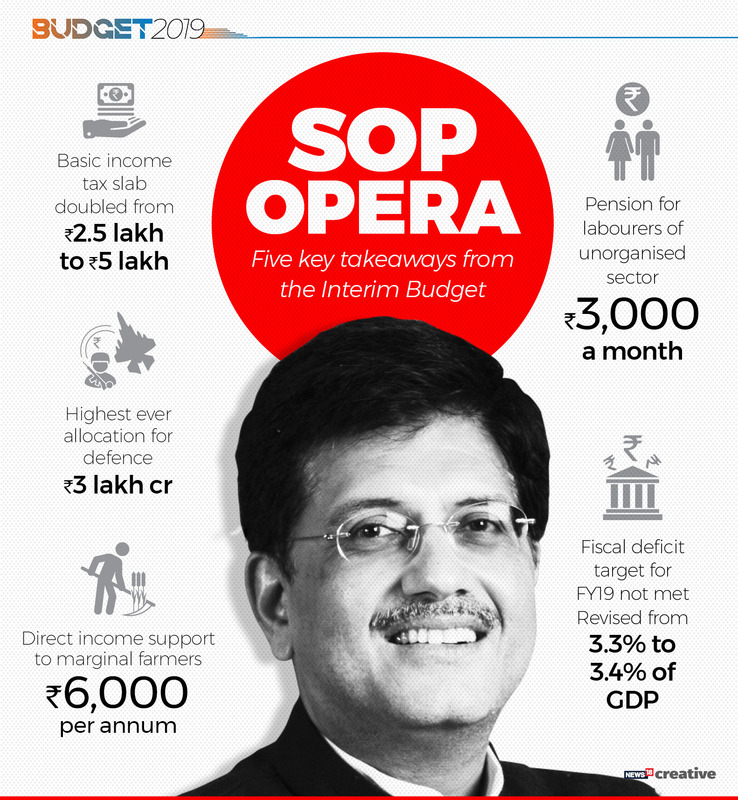 50% of the GDP comes from the sweat and toil of 42 crore workers in the unorganized sector: Piyush Goyal. For workers and labourers, a new pension scheme will come up to ensure an increase in Centre’s contribution by four percent. 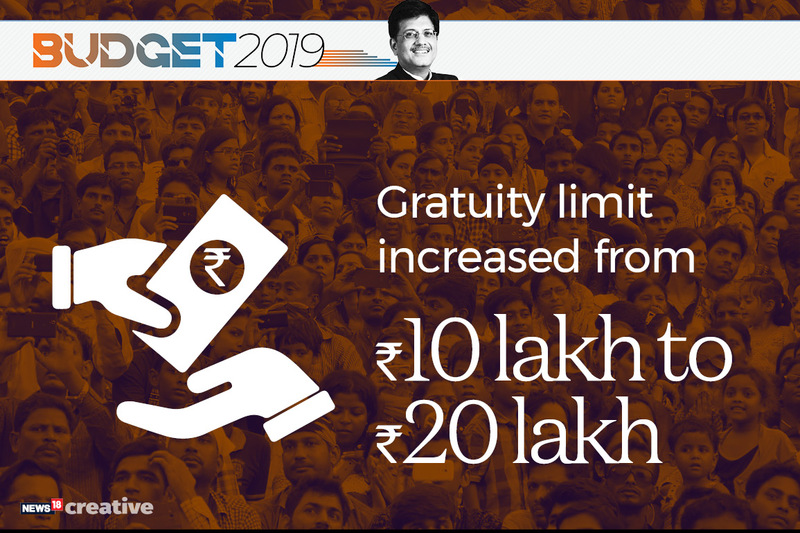 The pension has been increased from Rs 3,500 to Rs 7,000: FM Piyush Goyal. Instead of rescheduling of crop loans, those farmers severely affected by natural calamities will get 2% interest subvention and additional 3% interest subvention upon timely repayment: Piyush Goyal. 10 crore workers to benefit. Monthly pension of Rs 3,000 for workers in unorganised sector. New Pension Scheme – employee’s contribution is 10%, government’s contribution increased from 10% to 14%. Vix now down 5%. Market relaxed about the farm package – Manas Chakravarty – Group Consulting Editor. Farmers struck by natural calamities will now get 2-5% interest subvention under the crop insurance scheme, Goyal said. 12.5 crore farmers to be covered under direct income support – PM Kissan. Annual cash benefit of Rs 6000 (to be paid in three tranches) per head. The total outlay is only 0.4% of GDP. This will not lead to big surge in agri input demand but will only benefit basic staples consumption. – Madhuchanda Dey – Head Research. FMCG stocks rally with the farmer support announcements. Marico, HUL, ITC up 1-2%. 2 percent interest subsidy to be given to farmers involved in animal husbandry activities, to be given through kisaan credit card scheme, additional 3 percent subsidy on timely payment of loans. Stock of Mahindra & Mahindra, the market leader in tractors, is up nearly 2% on the BSE while that of Hero Motocorp the market leader in two-wheelers, stock is up by 3.35%. Separate Dept of Fisheries to be formed. The prices of medicines have come down with control of drugs, stents and knee implant prices. India is the second largest fish producing nation in the world and provides livelihood to 1.45 crore people. Towards development of this sector the govt will create a separate department of fisheries. Propose 2% interest subvention for those in fisheries. Rural FMCG demand has anyway been robust in FY19. The direct income support should add to this growth, for mass consumption items – Ravi Krishnan, Deputy Executive Editor. 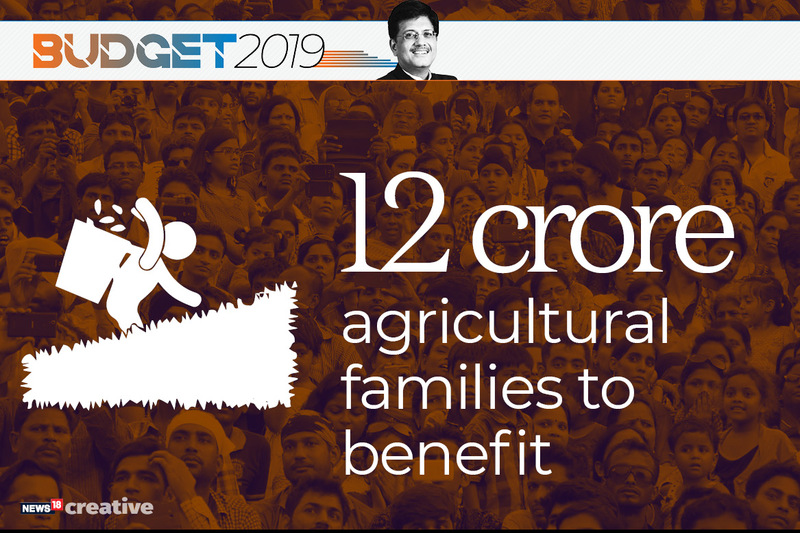 Piyush Goyal, finance minister said, “There is a need a structured income support to the poor land holder to procure seeds, equipments and other needs. To support them we have formed PM KISAN. Under this the vulnerable farmers, upto 2 hectares will get direct income support of Rs 6,000 per year. The amount will be transferred directly into bank accounts of the farmer in three installments. About 12 crore farmers will benefit from it. The scheme will kick off from December 1”. Health cards, quality seeds, irrigation facilities etc have been taken into consideration to improve the well being of farmers, he noted. PM Kisaan Samman Nidhi to support farmers in procuring basic farm inputs like seeds and fertiliser, to benefit seed and fertiliser companies. This will cost the govt around Rs 75,000 crore. Direct Benefit Support of Rs 6,000 to farmers with landholdings below 2 hectares – to be transferred directly into bank account of beneficiary farmers in three installments of Rs 2,000 each, funded by Govt of India – around 12 crore farmers to benefit from the scheme. The Kisan yojana will be effective December 1, 2018, and the money will be directly transferred into their account. 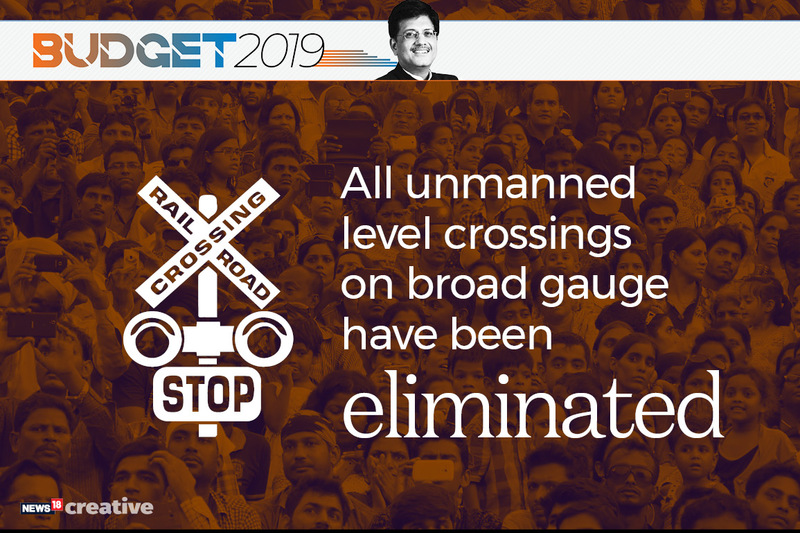 Expect spend of Rs 75,000 crore on this scheme, says Goyal. Rs 20,000 crore allocation will be added to the revised estimates of the FY18-19, he said. Govt approves PM Kisaan Samman Nidhi. Farmers owning upto 2 hectares to get Rs 6,000 per year. 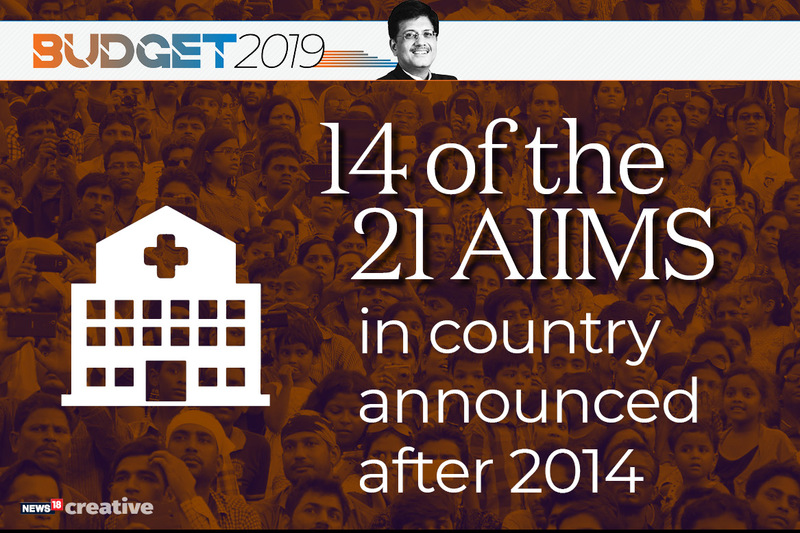 Ayushman Bharat, the world’s largest healthcare programme, was launched to provide medical care to nearly 50 crore people, resulting in Rs 3,000 crore savings by poor families: Piyush Goyal. One million people were treated so far under Ayushman Bharat. Have announced 14 new AIIMS since 2014. In 2014, 2.5 crore families were living without electricity, forced to live in the 18th century. We have achieved almost 100% electrification, says Goyal. As a tribute to Mahatma Gandhi, the world’s largest behavioural change movement Swachh Bharat was initiated; more than 98% rural sanitation coverage has been achieved, says Piyush Goyal. 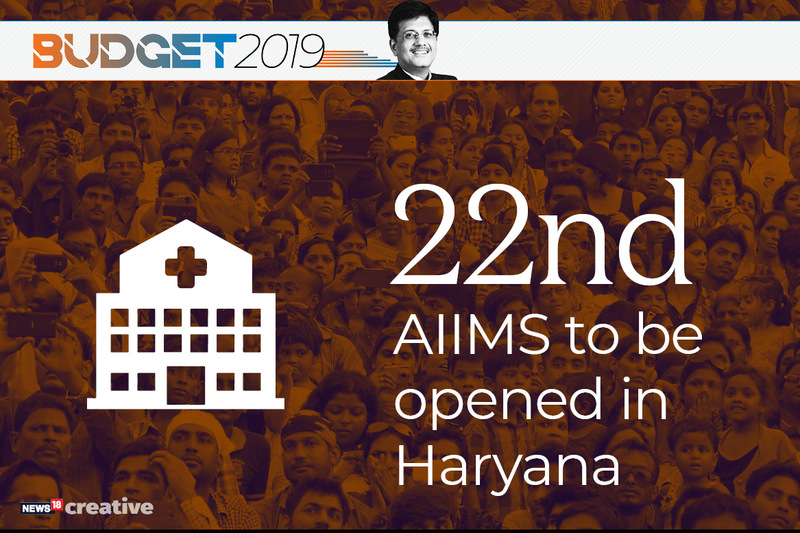 We are happy to announce that the 22nd AIIMS hospital is going to be set up in Haryana, Goyal said highlighting lower prices in terms of medicines, stents etc have led to massive scale up in healthcare over the last 5 years. PMGSY allocation Rs 19,000 crore, same as budgeted for 2018-19. 20 minutes into the speech, the Budget continues like a campaign pitch for the government. We launched the world’s largest healthcare program Ayushman Bharat to provide medical treatment to nearly 50 cr people, he reiterates. So far 10 lakh people have been treated under this scheme within the short span and nearly Rs 3,000 crore has been saved by those covered under it. Mahatma Gandhi National Rural Employment Guarantee program’s allocation increased by Rs 5000 crore to Rs 60,000 crore, Madhuchanda Dey – Head Research, Moneycontrol. Auto stocks firm, market appears to be betting on a likely farm package boosting demand for automobiles. Election speech on in full swing. Rs 3 lakh crore recovered by banks through IBC, says Goyal. Now bigger businessmen also concerned about repaying debt, he adds. 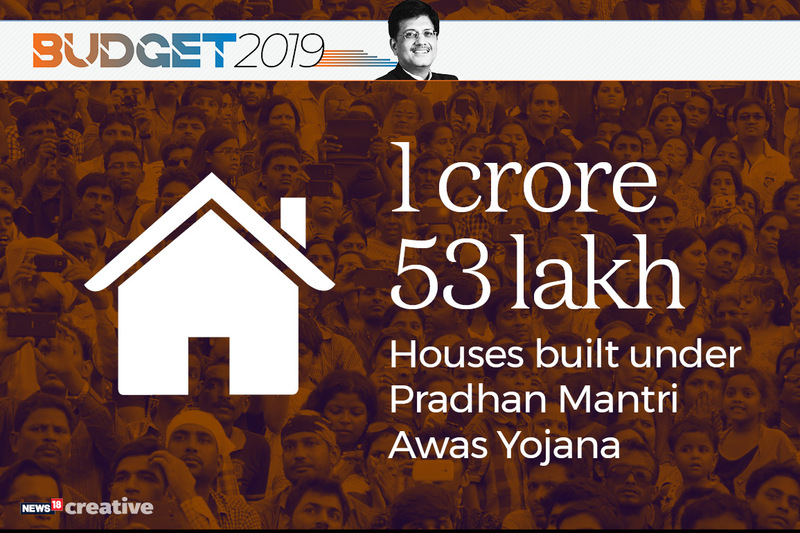 Have recovered Rs 3 lakh crore so far from the banking system clean up, Goyal points out as he moves to the initiatives in the real estate sector. Goyal takes dig at UPA government, by saying that his government has ended the practice of ‘phone’ banking at state-owned banks, and ushered more transparency. “The Rs 1 trillion GST collection in January would have given some comfort. Still Rs 2.8 trillion needed in the next two months to achieve budgeted estimates.” – Ravi Krishnan – Deputy Executive Editor, Moneycontrol. Current account deficit target for FY19 – 2.5% of GDP. Fiscal deficit revised target for FY19 – 3.4%. So, that’s a miss on the fiscal deficit target of 3.3% this year. Even this should be taken with a pinch of salt given the possibility of off-balance sheet items. He’s proud of restoring fiscal balance. Does that mean he will stick to the target? 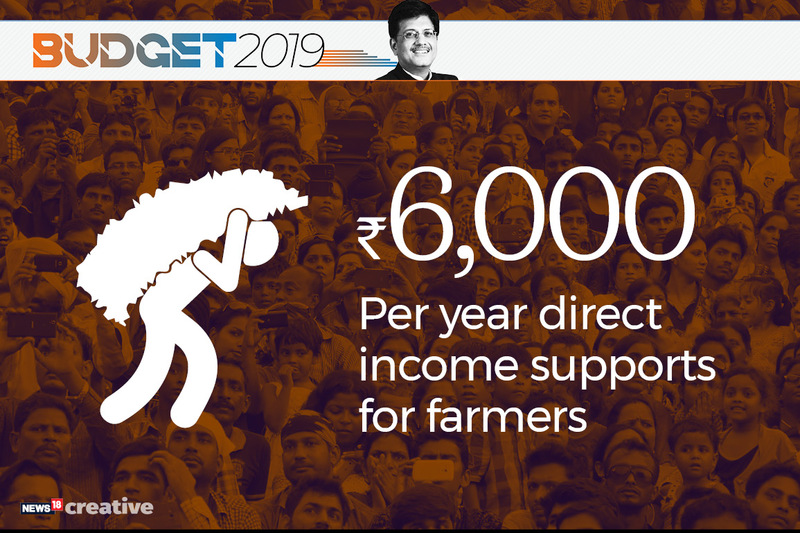 Piyush Goyal’s remark that farmer incomes have doubled, greeted with boos from the opposition benches. Goyal starts with recounting a litany of achievements for the Modi government. Reads like a poll pitch so far. We brought down average inflation to 4.6% lower than inflation during tenure of any other govt, he says. There is hope the government will also focus on pushing the sales of electric vehicles in the country. The finance ministry on Tuesday had lowered customs duty on electric vehicle parts to 10-15% from 15-30%. Society of Indian Automobile Manufacturers (SIAM) welcomed the move. 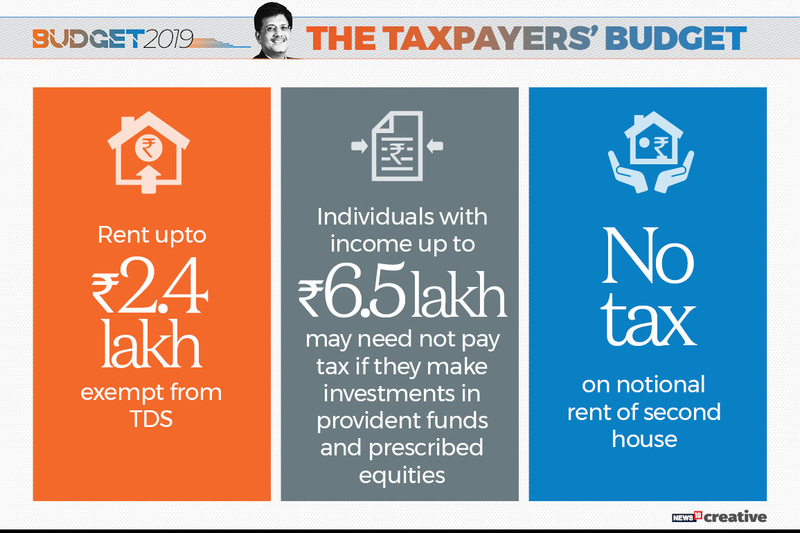 Union Minister Piyush Goyal presents the Budget 2019 in the Lok Sabha.